"Datacom" redirects here. For other uses, see Datacom (disambiguation). A computer network is a digital telecommunications network which allows nodes to share resources. In computer networks, computing devices exchange data with each other using connections (data links) between nodes. These data links are established over cable media such as wires or optic cables, or wireless media such as Wi-Fi. Network computer devices that originate, route and terminate the data are called network nodes. Nodes are generally identified by network addresses, and can include hosts such as personal computers, phones, and servers, as well as networking hardware such as routers and switches. Two such devices can be said to be networked together when one device is able to exchange information with the other device, whether or not they have a direct connection to each other. In most cases, application-specific communications protocols are layered (i.e. carried as payload) over other more general communications protocols. This formidable collection of information technology requires skilled network management to keep it all running reliably. Computer networks support an enormous number of applications and services such as access to the World Wide Web, digital video, digital audio, shared use of application and storage servers, printers, and fax machines, and use of email and instant messaging applications as well as many others. Computer networks differ in the transmission medium used to carry their signals, communications protocols to organize network traffic, the network's size, topology, traffic control mechanism and organizational intent. The best-known computer network is the Internet. In the late 1950s, early networks of computers included the U.S. military radar system Semi-Automatic Ground Environment (SAGE). In 1959, Anatolii Ivanovich Kitov proposed to the Central Committee of the Communist Party of the Soviet Union a detailed plan for the re-organisation of the control of the Soviet armed forces and of the Soviet economy on the basis of a network of computing centres, the OGAS. In 1960, the commercial airline reservation system semi-automatic business research environment (SABRE) went online with two connected mainframes. In 1963, J. C. R. Licklider sent a memorandum to office colleagues discussing the concept of the "Intergalactic Computer Network", a computer network intended to allow general communications among computer users. In 1964, researchers at Dartmouth College developed the Dartmouth Time Sharing System for distributed users of large computer systems. The same year, at Massachusetts Institute of Technology, a research group supported by General Electric and Bell Labs used a computer to route and manage telephone connections. Throughout the 1960s, Paul Baran and Donald Davies independently developed the concept of packet switching to transfer information between computers over a network. Davies pioneered the implementation of the concept with the NPL network, a local area network at the National Physical Laboratory (United Kingdom) using a line speed of 768 kbit/s. In 1965, Western Electric introduced the first widely used telephone switch that implemented true computer control. In 1966, Thomas Marill and Lawrence G. Roberts published a paper on an experimental wide area network (WAN) for computer time sharing. In 1969, the first four nodes of the ARPANET were connected using 50 kbit/s circuits between the University of California at Los Angeles, the Stanford Research Institute, the University of California at Santa Barbara, and the University of Utah. Leonard Kleinrock carried out theoretical work to model the performance of packet-switched networks, which underpinned the development of the ARPANET. His theoretical work on hierarchical routing in the late 1970s with student Farouk Kamoun remains critical to the operation of the Internet today. In 1972, commercial services using X.25 were deployed, and later used as an underlying infrastructure for expanding TCP/IP networks. In 1973, the French CYCLADES network was the first to make the hosts responsible for the reliable delivery of data, rather than this being a centralized service of the network itself. In 1973, Robert Metcalfe wrote a formal memo at Xerox PARC describing Ethernet, a networking system that was based on the Aloha network, developed in the 1960s by Norman Abramson and colleagues at the University of Hawaii. In July 1976, Robert Metcalfe and David Boggs published their paper "Ethernet: Distributed Packet Switching for Local Computer Networks" and collaborated on several patents received in 1977 and 1978. In 1979, Robert Metcalfe pursued making Ethernet an open standard. In 1976, John Murphy of Datapoint Corporation created ARCNET, a token-passing network first used to share storage devices. In 1995, the transmission speed capacity for Ethernet increased from 10 Mbit/s to 100 Mbit/s. By 1998, Ethernet supported transmission speeds of a Gigabit. Subsequently, higher speeds of up to 400 Gbit/s were added (as of 2018[update]). The ability of Ethernet to scale easily (such as quickly adapting to support new fiber optic cable speeds) is a contributing factor to its continued use. Computer networking may be considered a branch of electrical engineering, electronics engineering, telecommunications, computer science, information technology or computer engineering, since it relies upon the theoretical and practical application of the related disciplines. A computer network facilitates interpersonal communications allowing users to communicate efficiently and easily via various means: email, instant messaging, online chat, telephone, video telephone calls, and video conferencing. A network allows sharing of network and computing resources. Users may access and use resources provided by devices on the network, such as printing a document on a shared network printer or use of a shared storage device. A network allows sharing of files, data, and other types of information giving authorized users the ability to access information stored on other computers on the network. Distributed computing uses computing resources across a network to accomplish tasks. A computer network may be used by security hackers to deploy computer viruses or computer worms on devices connected to the network, or to prevent these devices from accessing the network via a denial-of-service attack. Computer communication links that do not support packets, such as traditional point-to-point telecommunication links, simply transmit data as a bit stream. However, the overwhelming majority of computer networks carry their data in packets. A network packet is a formatted unit of data (a list of bits or bytes, usually a few tens of bytes to a few kilobytes long) carried by a packet-switched network. Packets are sent through the network to their destination. Once the packets arrive they are reassembled into their original message. Packets consist of two kinds of data: control information, and user data (payload). The control information provides data the network needs to deliver the user data, for example: source and destination network addresses, error detection codes, and sequencing information. Typically, control information is found in packet headers and trailers, with payload data in between. With packets, the bandwidth of the transmission medium can be better shared among users than if the network were circuit switched. When one user is not sending packets, the link can be filled with packets from other users, and so the cost can be shared, with relatively little interference, provided the link isn't overused. Often the route a packet needs to take through a network is not immediately available. In that case the packet is queued and waits until a link is free. The physical layout of a network is usually less important than the topology that connects network nodes. Most diagrams that describe a physical network are therefore topological, rather than geographic. The symbols on these diagrams usually denote network links and network nodes. The transmission media (often referred to in the literature as the physical media) used to link devices to form a computer network include electrical cable, optical fiber, and radio waves. In the OSI model, these are defined at layers 1 and 2 — the physical layer and the data link layer. A widely adopted family of transmission media used in local area network (LAN) technology is collectively known as Ethernet. The media and protocol standards that enable communication between networked devices over Ethernet are defined by IEEE 802.3. Ethernet transmits data over both copper and fiber cables. Wireless LAN standards use radio waves, others use infrared signals as a transmission medium. Power line communication uses a building's power cabling to transmit data. The following classes of wired technologies are used in computer networking. Coaxial cable is widely used for cable television systems, office buildings, and other work-sites for local area networks. Transmission speed ranges from 200 million bits per second to more than 500 million bits per second. ITU-T G.hn technology uses existing home wiring (coaxial cable, phone lines and power lines) to create a high-speed local area network. Twisted pair cabling is used for wired Ethernet and other standards. It typically consists of 4 pairs of copper cabling that can be utilized for both voice and data transmission. The use of two wires twisted together helps to reduce crosstalk and electromagnetic induction. The transmission speed ranges from 2 Mbit/s to 10 Gbit/s. Twisted pair cabling comes in two forms: unshielded twisted pair (UTP) and shielded twisted-pair (STP). Each form comes in several category ratings, designed for use in various scenarios. 2007 map showing submarine optical fiber telecommunication cables around the world. An optical fiber is a glass fiber. It carries pulses of light that represent data. Some advantages of optical fibers over metal wires are very low transmission loss and immunity to electrical interference. Optical fibers can simultaneously carry multiple streams of data on different wavelengths of light, which greatly increases the rate that data can be sent to up to trillions of bits per second. 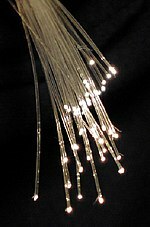 Optic fibers can be used for long runs of cable carrying very high data rates, and are used for undersea cables to interconnect continents. There are two basic types of fiber optics, single-mode optical fiber (SMF) and multi-mode optical fiber (MMF). Single-mode fiber has the advantage of being able to sustain a coherent signal for dozens or even a hundred kilometers. Multimode fiber is cheaper to terminate but is limited to a few hundred or even only a few dozens of meters, depending on the data rate and cable grade. Terrestrial microwave – Terrestrial microwave communication uses Earth-based transmitters and receivers resembling satellite dishes. Terrestrial microwaves are in the low gigahertz range, which limits all communications to line-of-sight. Relay stations are spaced approximately 48 km (30 mi) apart. Communications satellites – Satellites communicate via microwave radio waves, which are not deflected by the Earth's atmosphere. The satellites are stationed in space, typically in geosynchronous orbit 35,400 km (22,000 mi) above the equator. These Earth-orbiting systems are capable of receiving and relaying voice, data, and TV signals. Cellular and PCS systems use several radio communications technologies. The systems divide the region covered into multiple geographic areas. Each area has a low-power transmitter or radio relay antenna device to relay calls from one area to the next area. Radio and spread spectrum technologies – Wireless local area networks use a high-frequency radio technology similar to digital cellular and a low-frequency radio technology. Wireless LANs use spread spectrum technology to enable communication between multiple devices in a limited area. IEEE 802.11 defines a common flavor of open-standards wireless radio-wave technology known as Wi-Fi. Free-space optical communication uses visible or invisible light for communications. In most cases, line-of-sight propagation is used, which limits the physical positioning of communicating devices. IP over Avian Carriers was a humorous April fool's Request for Comments, issued as RFC 1149. It was implemented in real life in 2001. Extending the Internet to interplanetary dimensions via radio waves, the Interplanetary Internet. Both cases have a large round-trip delay time, which gives slow two-way communication, but doesn't prevent sending large amounts of information. Apart from any physical transmission media there may be, networks comprise additional basic system building blocks, such as network interface controllers (NICs), repeaters, hubs, bridges, switches, routers, modems, and firewalls. Any particular piece of equipment will frequently contain multiple building blocks and perform multiple functions. An ATM network interface in the form of an accessory card. A lot of network interfaces are built-in. A network interface controller (NIC) is computer hardware that provides a computer with the ability to access the transmission media, and has the ability to process low-level network information. For example, the NIC may have a connector for accepting a cable, or an aerial for wireless transmission and reception, and the associated circuitry. The NIC responds to traffic addressed to a network address for either the NIC or the computer as a whole. In Ethernet networks, each network interface controller has a unique Media Access Control (MAC) address—usually stored in the controller's permanent memory. To avoid address conflicts between network devices, the Institute of Electrical and Electronics Engineers (IEEE) maintains and administers MAC address uniqueness. The size of an Ethernet MAC address is six octets. The three most significant octets are reserved to identify NIC manufacturers. These manufacturers, using only their assigned prefixes, uniquely assign the three least-significant octets of every Ethernet interface they produce. A repeater is an electronic device that receives a network signal, cleans it of unnecessary noise and regenerates it. The signal is retransmitted at a higher power level, or to the other side of an obstruction, so that the signal can cover longer distances without degradation. In most twisted pair Ethernet configurations, repeaters are required for cable that runs longer than 100 meters. With fiber optics, repeaters can be tens or even hundreds of kilometers apart. A repeater with multiple ports is known as an Ethernet hub. Repeaters work on the physical layer of the OSI model. Repeaters require a small amount of time to regenerate the signal. This can cause a propagation delay that affects network performance and may affect proper function. As a result, many network architectures limit the number of repeaters that can be used in a row, e.g., the Ethernet 5-4-3 rule. Hubs and repeaters in LANs have been mostly obsoleted by modern switches. A network bridge connects and filters traffic between two network segments at the data link layer (layer 2) of the OSI model to form a single network. This breaks the network's collision domain but maintains a unified broadcast domain. Network segmentation breaks down a large, congested network into an aggregation of smaller, more efficient networks. Remote bridges: Can be used to create a wide area network (WAN) link between LANs. Remote bridges, where the connecting link is slower than the end networks, largely have been replaced with routers. Wireless bridges: Can be used to join LANs or connect remote devices to LANs. A network switch is a device that forwards and filters OSI layer 2 datagrams (frames) between ports based on the destination MAC address in each frame. A switch is distinct from a hub in that it only forwards the frames to the physical ports involved in the communication rather than all ports connected. It can be thought of as a multi-port bridge. It learns to associate physical ports to MAC addresses by examining the source addresses of received frames. If an unknown destination is targeted, the switch broadcasts to all ports but the source. Switches normally have numerous ports, facilitating a star topology for devices, and cascading additional switches. A router is an internetworking device that forwards packets between networks by processing the routing information included in the packet or datagram (Internet protocol information from layer 3). The routing information is often processed in conjunction with the routing table (or forwarding table). A router uses its routing table to determine where to forward packets. A destination in a routing table can include a "null" interface, also known as the "black hole" interface because data can go into it, however, no further processing is done for said data, i.e. the packets are dropped. Modems (MOdulator-DEModulator) are used to connect network nodes via wire not originally designed for digital network traffic, or for wireless. To do this one or more carrier signals are modulated by the digital signal to produce an analog signal that can be tailored to give the required properties for transmission. Modems are commonly used for telephone lines, using a Digital Subscriber Line technology. A firewall is a network device for controlling network security and access rules. Firewalls are typically configured to reject access requests from unrecognized sources while allowing actions from recognized ones. The vital role firewalls play in network security grows in parallel with the constant increase in cyber attacks. Network topology is the layout or organizational hierarchy of interconnected nodes of a computer network. Different network topologies can affect throughput, but reliability is often more critical. With many technologies, such as bus networks, a single failure can cause the network to fail entirely. In general the more interconnections there are, the more robust the network is; but the more expensive it is to install. A bus network: all nodes are connected to a common medium along this medium. This was the layout used in the original Ethernet, called 10BASE5 and 10BASE2. This is still a common topology on the data link layer, although modern physical layer variants use point-to-point links instead. A star network: all nodes are connected to a special central node. This is the typical layout found in a Wireless LAN, where each wireless client connects to the central Wireless access point. A ring network: each node is connected to its left and right neighbour node, such that all nodes are connected and that each node can reach each other node by traversing nodes left- or rightwards. The Fiber Distributed Data Interface (FDDI) made use of such a topology. A mesh network: each node is connected to an arbitrary number of neighbours in such a way that there is at least one traversal from any node to any other. A fully connected network: each node is connected to every other node in the network. A tree network: nodes are arranged hierarchically. Note that the physical layout of the nodes in a network may not necessarily reflect the network topology. As an example, with FDDI, the network topology is a ring (actually two counter-rotating rings), but the physical topology is often a star, because all neighboring connections can be routed via a central physical location. An overlay network is a virtual computer network that is built on top of another network. Nodes in the overlay network are connected by virtual or logical links. Each link corresponds to a path, perhaps through many physical links, in the underlying network. The topology of the overlay network may (and often does) differ from that of the underlying one. For example, many peer-to-peer networks are overlay networks. They are organized as nodes of a virtual system of links that run on top of the Internet. Overlay networks have been around since the invention of networking when computer systems were connected over telephone lines using modems, before any data network existed. The most striking example of an overlay network is the Internet itself. The Internet itself was initially built as an overlay on the telephone network. Even today, each Internet node can communicate with virtually any other through an underlying mesh of sub-networks of wildly different topologies and technologies. Address resolution and routing are the means that allow mapping of a fully connected IP overlay network to its underlying network. Another example of an overlay network is a distributed hash table, which maps keys to nodes in the network. In this case, the underlying network is an IP network, and the overlay network is a table (actually a map) indexed by keys. Overlay networks have also been proposed as a way to improve Internet routing, such as through quality of service guarantees to achieve higher-quality streaming media. Previous proposals such as IntServ, DiffServ, and IP Multicast have not seen wide acceptance largely because they require modification of all routers in the network. On the other hand, an overlay network can be incrementally deployed on end-hosts running the overlay protocol software, without cooperation from Internet service providers. The overlay network has no control over how packets are routed in the underlying network between two overlay nodes, but it can control, for example, the sequence of overlay nodes that a message traverses before it reaches its destination. For example, Akamai Technologies manages an overlay network that provides reliable, efficient content delivery (a kind of multicast). Academic research includes end system multicast, resilient routing and quality of service studies, among others. The TCP/IP model or Internet layering scheme and its relation to common protocols often layered on top of it. Message flows (A-B) in the presence of a router (R), red flows are effective communication paths, black paths are across the actual network links. A communication protocol is a set of rules for exchanging information over a network. In a protocol stack (also see the OSI model), each protocol leverages the services of the protocol layer below it, until the lowest layer controls the hardware which sends information across the media. The use of protocol layering is today ubiquitous across the field of computer networking. An important example of a protocol stack is HTTP (the World Wide Web protocol) running over TCP over IP (the Internet protocols) over IEEE 802.11 (the Wi-Fi protocol). This stack is used between the wireless router and the home user's personal computer when the user is surfing the web. There are many communication protocols, a few of which are described below. IEEE 802 is a family of IEEE standards dealing with local area networks and metropolitan area networks. The complete IEEE 802 protocol suite provides a diverse set of networking capabilities. The protocols have a flat addressing scheme. They operate mostly at levels 1 and 2 of the OSI model. For example, MAC bridging (IEEE 802.1D) deals with the routing of Ethernet packets using a Spanning Tree Protocol. IEEE 802.1Q describes VLANs, and IEEE 802.1X defines a port-based Network Access Control protocol, which forms the basis for the authentication mechanisms used in VLANs (but it is also found in WLANs) – it is what the home user sees when the user has to enter a "wireless access key". Ethernet, sometimes simply called LAN, is a family of protocols used in wired LANs, described by a set of standards together called IEEE 802.3 published by the Institute of Electrical and Electronics Engineers. Wireless LAN, also widely known as WLAN or WiFi, is probably the most well-known member of the IEEE 802 protocol family for home users today. It is standardized by IEEE 802.11 and shares many properties with wired Ethernet. The Internet Protocol Suite, also called TCP/IP, is the foundation of all modern networking. It offers connection-less as well as connection-oriented services over an inherently unreliable network traversed by data-gram transmission at the Internet protocol (IP) level. At its core, the protocol suite defines the addressing, identification, and routing specifications for Internet Protocol Version 4 (IPv4) and for IPv6, the next generation of the protocol with a much enlarged addressing capability. Synchronous optical networking (SONET) and Synchronous Digital Hierarchy (SDH) are standardized multiplexing protocols that transfer multiple digital bit streams over optical fiber using lasers. They were originally designed to transport circuit mode communications from a variety of different sources, primarily to support real-time, uncompressed, circuit-switched voice encoded in PCM (Pulse-Code Modulation) format. However, due to its protocol neutrality and transport-oriented features, SONET/SDH also was the obvious choice for transporting Asynchronous Transfer Mode (ATM) frames. Asynchronous Transfer Mode (ATM) is a switching technique for telecommunication networks. It uses asynchronous time-division multiplexing and encodes data into small, fixed-sized cells. This differs from other protocols such as the Internet Protocol Suite or Ethernet that use variable sized packets or frames. ATM has similarity with both circuit and packet switched networking. This makes it a good choice for a network that must handle both traditional high-throughput data traffic, and real-time, low-latency content such as voice and video. ATM uses a connection-oriented model in which a virtual circuit must be established between two endpoints before the actual data exchange begins. While the role of ATM is diminishing in favor of next-generation networks, it still plays a role in the last mile, which is the connection between an Internet service provider and the home user. There are a number of different digital cellular standards, including: Global System for Mobile Communications (GSM), General Packet Radio Service (GPRS), cdmaOne, CDMA2000, Evolution-Data Optimized (EV-DO), Enhanced Data Rates for GSM Evolution (EDGE), Universal Mobile Telecommunications System (UMTS), Digital Enhanced Cordless Telecommunications (DECT), Digital AMPS (IS-136/TDMA), and Integrated Digital Enhanced Network (iDEN). A network can be characterized by its physical capacity or its organizational purpose. Use of the network, including user authorization and access rights, differ accordingly. A nanoscale communication network has key components implemented at the nanoscale including message carriers and leverages physical principles that differ from macroscale communication mechanisms. Nanoscale communication extends communication to very small sensors and actuators such as those found in biological systems and also tends to operate in environments that would be too harsh for classical communication. A personal area network (PAN) is a computer network used for communication among computer and different information technological devices close to one person. Some examples of devices that are used in a PAN are personal computers, printers, fax machines, telephones, PDAs, scanners, and even video game consoles. A PAN may include wired and wireless devices. The reach of a PAN typically extends to 10 meters. A wired PAN is usually constructed with USB and FireWire connections while technologies such as Bluetooth and infrared communication typically form a wireless PAN. A local area network (LAN) is a network that connects computers and devices in a limited geographical area such as a home, school, office building, or closely positioned group of buildings. Each computer or device on the network is a node. Wired LANs are most likely based on Ethernet technology. Newer standards such as ITU-T G.hn also provide a way to create a wired LAN using existing wiring, such as coaxial cables, telephone lines, and power lines. The defining characteristics of a LAN, in contrast to a wide area network (WAN), include higher data transfer rates, limited geographic range, and lack of reliance on leased lines to provide connectivity. Current Ethernet or other IEEE 802.3 LAN technologies operate at data transfer rates up to 100 Gbit/s, standardized by IEEE in 2010. Currently, 400 Gbit/s Ethernet is being developed. A LAN can be connected to a WAN using a router. A home area network (HAN) is a residential LAN used for communication between digital devices typically deployed in the home, usually a small number of personal computers and accessories, such as printers and mobile computing devices. An important function is the sharing of Internet access, often a broadband service through a cable TV or digital subscriber line (DSL) provider. A storage area network (SAN) is a dedicated network that provides access to consolidated, block level data storage. SANs are primarily used to make storage devices, such as disk arrays, tape libraries, and optical jukeboxes, accessible to servers so that the devices appear like locally attached devices to the operating system. A SAN typically has its own network of storage devices that are generally not accessible through the local area network by other devices. The cost and complexity of SANs dropped in the early 2000s to levels allowing wider adoption across both enterprise and small to medium-sized business environments. A campus area network (CAN) is made up of an interconnection of LANs within a limited geographical area. The networking equipment (switches, routers) and transmission media (optical fiber, copper plant, Cat5 cabling, etc.) are almost entirely owned by the campus tenant / owner (an enterprise, university, government, etc.). For example, a university campus network is likely to link a variety of campus buildings to connect academic colleges or departments, the library, and student residence halls. A backbone network is part of a computer network infrastructure that provides a path for the exchange of information between different LANs or sub-networks. A backbone can tie together diverse networks within the same building, across different buildings, or over a wide area. For example, a large company might implement a backbone network to connect departments that are located around the world. The equipment that ties together the departmental networks constitutes the network backbone. When designing a network backbone, network performance and network congestion are critical factors to take into account. Normally, the backbone network's capacity is greater than that of the individual networks connected to it. Another example of a backbone network is the Internet backbone, which is the set of wide area networks (WANs) and core routers that tie together all networks connected to the Internet. A Metropolitan area network (MAN) is a large computer network that usually spans a city or a large campus. 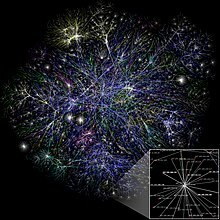 A wide area network (WAN) is a computer network that covers a large geographic area such as a city, country, or spans even intercontinental distances. A WAN uses a communications channel that combines many types of media such as telephone lines, cables, and air waves. A WAN often makes use of transmission facilities provided by common carriers, such as telephone companies. WAN technologies generally function at the lower three layers of the OSI reference model: the physical layer, the data link layer, and the network layer. An enterprise private network is a network that a single organization builds to interconnect its office locations (e.g., production sites, head offices, remote offices, shops) so they can share computer resources. A virtual private network (VPN) is an overlay network in which some of the links between nodes are carried by open connections or virtual circuits in some larger network (e.g., the Internet) instead of by physical wires. The data link layer protocols of the virtual network are said to be tunneled through the larger network when this is the case. One common application is secure communications through the public Internet, but a VPN need not have explicit security features, such as authentication or content encryption. VPNs, for example, can be used to separate the traffic of different user communities over an underlying network with strong security features. VPN may have best-effort performance, or may have a defined service level agreement (SLA) between the VPN customer and the VPN service provider. Generally, a VPN has a topology more complex than point-to-point. A global area network (GAN) is a network used for supporting mobile across an arbitrary number of wireless LANs, satellite coverage areas, etc. The key challenge in mobile communications is handing off user communications from one local coverage area to the next. In IEEE Project 802, this involves a succession of terrestrial wireless LANs. Networks are typically managed by the organizations that own them. Private enterprise networks may use a combination of intranets and extranets. They may also provide network access to the Internet, which has no single owner and permits virtually unlimited global connectivity. An intranet is a set of networks that are under the control of a single administrative entity. The intranet uses the IP protocol and IP-based tools such as web browsers and file transfer applications. The administrative entity limits use of the intranet to its authorized users. Most commonly, an intranet is the internal LAN of an organization. A large intranet typically has at least one web server to provide users with organizational information. An intranet is also anything behind the router on a local area network. An extranet is a network that is also under the administrative control of a single organization, but supports a limited connection to a specific external network. For example, an organization may provide access to some aspects of its intranet to share data with its business partners or customers. These other entities are not necessarily trusted from a security standpoint. Network connection to an extranet is often, but not always, implemented via WAN technology. An internetwork is the connection of multiple computer networks via a common routing technology using routers. Partial map of the Internet based on the January 15, 2005 data found on opte.org. Each line is drawn between two nodes, representing two IP addresses. The length of the lines are indicative of the delay between those two nodes. This graph represents less than 30% of the Class C networks reachable. The Internet is the largest example of an internetwork. It is a global system of interconnected governmental, academic, corporate, public, and private computer networks. It is based on the networking technologies of the Internet Protocol Suite. It is the successor of the Advanced Research Projects Agency Network (ARPANET) developed by DARPA of the United States Department of Defense. The Internet is also the communications backbone underlying the World Wide Web (WWW). A darknet is an overlay network, typically running on the Internet, that is only accessible through specialized software. A darknet is an anonymizing network where connections are made only between trusted peers — sometimes called "friends" (F2F) — using non-standard protocols and ports. Darknets are distinct from other distributed peer-to-peer networks as sharing is anonymous (that is, IP addresses are not publicly shared), and therefore users can communicate with little fear of governmental or corporate interference. Routing calculates good paths through a network for information to take. For example, from node 1 to node 6 the best routes are likely to be 1-8-7-6 or 1-8-10-6, as this has the thickest routes. Routing is the process of selecting network paths to carry network traffic. Routing is performed for many kinds of networks, including circuit switching networks and packet switched networks. In packet switched networks, routing directs packet forwarding (the transit of logically addressed network packets from their source toward their ultimate destination) through intermediate nodes. Intermediate nodes are typically network hardware devices such as routers, bridges, gateways, firewalls, or switches. General-purpose computers can also forward packets and perform routing, though they are not specialized hardware and may suffer from limited performance. The routing process usually directs forwarding on the basis of routing tables, which maintain a record of the routes to various network destinations. Thus, constructing routing tables, which are held in the router's memory, is very important for efficient routing. Most routing algorithms use only one network path at a time. Multipath routing techniques enable the use of multiple alternative paths. Routing, in a more narrow sense of the term, is often contrasted with bridging in its assumption that network addresses are structured and that similar addresses imply proximity within the network. Structured addresses allow a single routing table entry to represent the route to a group of devices. In large networks, structured addressing (routing, in the narrow sense) outperforms unstructured addressing (bridging). Routing has become the dominant form of addressing on the Internet. Bridging is still widely used within localized environments. Network services are applications hosted by servers on a computer network, to provide some functionality for members or users of the network, or to help the network itself to operate. The World Wide Web, E-mail, printing and network file sharing are examples of well-known network services. Network services such as DNS (Domain Name System) give names for IP and MAC addresses (people remember names like “nm.lan” better than numbers like “210.121.67.18”), and DHCP to ensure that the equipment on the network has a valid IP address. Services are usually based on a service protocol that defines the format and sequencing of messages between clients and servers of that network service. Depending on the installation requirements, network performance is usually measured by the quality of service of a telecommunications product. The parameters that affect this typically can include throughput, jitter, bit error rate and latency. Circuit-switched networks: In circuit switched networks, network performance is synonymous with the grade of service. The number of rejected calls is a measure of how well the network is performing under heavy traffic loads. Other types of performance measures can include the level of noise and echo. There are many ways to measure the performance of a network, as each network is different in nature and design. Performance can also be modelled instead of measured. For example, state transition diagrams are often used to model queuing performance in a circuit-switched network. The network planner uses these diagrams to analyze how the network performs in each state, ensuring that the network is optimally designed. Network congestion occurs when a link or node is carrying so much data that its quality of service deteriorates. Typical effects include queueing delay, packet loss or the blocking of new connections. A consequence of these latter two is that incremental increases in offered load lead either only to small increase in network throughput, or to an actual reduction in network throughput. Network protocols that use aggressive retransmissions to compensate for packet loss tend to keep systems in a state of network congestion—even after the initial load is reduced to a level that would not normally induce network congestion. Thus, networks using these protocols can exhibit two stable states under the same level of load. The stable state with low throughput is known as congestive collapse. Modern networks use congestion control, congestion avoidance and traffic control techniques to try to avoid congestion collapse. These include: exponential backoff in protocols such as 802.11's CSMA/CA and the original Ethernet, window reduction in TCP, and fair queueing in devices such as routers. Another method to avoid the negative effects of network congestion is implementing priority schemes, so that some packets are transmitted with higher priority than others. Priority schemes do not solve network congestion by themselves, but they help to alleviate the effects of congestion for some services. An example of this is 802.1p. A third method to avoid network congestion is the explicit allocation of network resources to specific flows. One example of this is the use of Contention-Free Transmission Opportunities (CFTXOPs) in the ITU-T G.hn standard, which provides high-speed (up to 1 Gbit/s) Local area networking over existing home wires (power lines, phone lines and coaxial cables). For the Internet, RFC 2914 addresses the subject of congestion control in detail. Network security consists of provisions and policies adopted by the network administrator to prevent and monitor unauthorized access, misuse, modification, or denial of the computer network and its network-accessible resources. Network security is the authorization of access to data in a network, which is controlled by the network administrator. Users are assigned an ID and password that allows them access to information and programs within their authority. Network security is used on a variety of computer networks, both public and private, to secure daily transactions and communications among businesses, government agencies and individuals. Network surveillance is the monitoring of data being transferred over computer networks such as the Internet. The monitoring is often done surreptitiously and may be done by or at the behest of governments, by corporations, criminal organizations, or individuals. It may or may not be legal and may or may not require authorization from a court or other independent agency. Computer and network surveillance programs are widespread today, and almost all Internet traffic is or could potentially be monitored for clues to illegal activity. Surveillance is very useful to governments and law enforcement to maintain social control, recognize and monitor threats, and prevent/investigate criminal activity. With the advent of programs such as the Total Information Awareness program, technologies such as high speed surveillance computers and biometrics software, and laws such as the Communications Assistance For Law Enforcement Act, governments now possess an unprecedented ability to monitor the activities of citizens. However, many civil rights and privacy groups—such as Reporters Without Borders, the Electronic Frontier Foundation, and the American Civil Liberties Union—have expressed concern that increasing surveillance of citizens may lead to a mass surveillance society, with limited political and personal freedoms. Fears such as this have led to numerous lawsuits such as Hepting v. AT&T. The hacktivist group Anonymous has hacked into government websites in protest of what it considers "draconian surveillance". End-to-end encryption (E2EE) is a digital communications paradigm of uninterrupted protection of data traveling between two communicating parties. It involves the originating party encrypting data so only the intended recipient can decrypt it, with no dependency on third parties. End-to-end encryption prevents intermediaries, such as Internet providers or application service providers, from discovering or tampering with communications. End-to-end encryption generally protects both confidentiality and integrity. Examples of end-to-end encryption include HTTPS for web traffic, PGP for email, OTR for instant messaging, ZRTP for telephony, and TETRA for radio. Typical server-based communications systems do not include end-to-end encryption. These systems can only guarantee protection of communications between clients and servers, not between the communicating parties themselves. Examples of non-E2EE systems are Google Talk, Yahoo Messenger, Facebook, and Dropbox. Some such systems, for example LavaBit and SecretInk, have even described themselves as offering "end-to-end" encryption when they do not. Some systems that normally offer end-to-end encryption have turned out to contain a back door that subverts negotiation of the encryption key between the communicating parties, for example Skype or Hushmail. The end-to-end encryption paradigm does not directly address risks at the communications endpoints themselves, such as the technical exploitation of clients, poor quality random number generators, or key escrow. E2EE also does not address traffic analysis, which relates to things such as the identities of the end points and the times and quantities of messages that are sent. The introduction and rapid growth of e-commerce on the world wide web in the mid-1990s made it obvious that some form of authentication and encryption was needed. Netscape took the first shot at a new standard. At the time, the dominant web browser was Netscape Navigator. Netscape created a standard called secure socket layer (SSL). SSL requires a server with a certificate. When a client requests access to an SSL-secured server, the server sends a copy of the certificate to the client. The SSL client checks this certificate (all web browsers come with an exhaustive list of CA root certificates preloaded), and if the certificate checks out, the server is authenticated and the client negotiates a symmetric-key cipher for use in the session. The session is now in a very secure encrypted tunnel between the SSL server and the SSL client. Users and network administrators typically have different views of their networks. Users can share printers and some servers from a workgroup, which usually means they are in the same geographic location and are on the same LAN, whereas a Network Administrator is responsible to keep that network up and running. A community of interest has less of a connection of being in a local area, and should be thought of as a set of arbitrarily located users who share a set of servers, and possibly also communicate via peer-to-peer technologies. Network administrators can see networks from both physical and logical perspectives. The physical perspective involves geographic locations, physical cabling, and the network elements (e.g., routers, bridges and application layer gateways) that interconnect via the transmission media. Logical networks, called, in the TCP/IP architecture, subnets, map onto one or more transmission media. For example, a common practice in a campus of buildings is to make a set of LAN cables in each building appear to be a common subnet, using virtual LAN (VLAN) technology. Both users and administrators are aware, to varying extents, of the trust and scope characteristics of a network. Again using TCP/IP architectural terminology, an intranet is a community of interest under private administration usually by an enterprise, and is only accessible by authorized users (e.g. employees). Intranets do not have to be connected to the Internet, but generally have a limited connection. An extranet is an extension of an intranet that allows secure communications to users outside of the intranet (e.g. business partners, customers). Unofficially, the Internet is the set of users, enterprises, and content providers that are interconnected by Internet Service Providers (ISP). From an engineering viewpoint, the Internet is the set of subnets, and aggregates of subnets, which share the registered IP address space and exchange information about the reachability of those IP addresses using the Border Gateway Protocol. Typically, the human-readable names of servers are translated to IP addresses, transparently to users, via the directory function of the Domain Name System (DNS). Over the Internet, there can be business-to-business (B2B), business-to-consumer (B2C) and consumer-to-consumer (C2C) communications. When money or sensitive information is exchanged, the communications are apt to be protected by some form of communications security mechanism. Intranets and extranets can be securely superimposed onto the Internet, without any access by general Internet users and administrators, using secure Virtual Private Network (VPN) technology. ^ Isaacson, Walter (2014). The Innovators: How a Group of Hackers, Geniuses, and Geeks Created the Digital Revolution. Simon and Schuster. pp. 237–246. ^ "Inductee Details - Paul Baran". National Inventors Hall of Fame. Retrieved 6 September 2017. ^ "Inductee Details - Donald Watts Davies". National Inventors Hall of Fame. Retrieved 6 September 2017. ^ Roberts, Larry; Marrill, Tom (October 1966). Toward a Cooperative Network of Time-Shared Computers. Fall AFIPS Conference. ^ Chris Sutton. "Internet Began 35 Years Ago at UCLA with First Message Ever Sent Between Two Computers". UCLA. Archived from the original on March 8, 2008. ^ Gillies, James; Cailliau, Robert (2000). How the Web was Born: The Story of the World Wide Web. Oxford University Press. p. 25. ISBN 0192862073. ^ C. Hempstead; W. Worthington (2005). Encyclopedia of 20th-Century Technology. Routledge. ^ Bennett, Richard (September 2009). "Designed for Change: End-to-End Arguments, Internet Innovation, and the Net Neutrality Debate" (PDF). Information Technology and Innovation Foundation. p. 11. Retrieved 11 September 2017. ^ Robert M. Metcalfe; David R. Boggs (July 1976). "Ethernet: Distributed Packet Switching for Local Computer Networks". Communications of the ACM. 19 (5): 395–404. Archived from the original on 2007-08-07. ^ a b Spurgeon, Charles E. (2000). Ethernet The Definitive Guide. O'Reilly & Associates. ISBN 1-56592-660-9. ^ a b Meyers, Mike (2012). CompTIA Network+ exam guide : (exam N10-005) (5th ed.). New York: McGraw-Hill. ISBN 9780071789226. OCLC 748332969. ^ "Bergen Linux User Group's CPIP Implementation". Blug.linux.no. Retrieved 2014-03-01. ^ "Define switch". webopedia. Retrieved April 8, 2008. ^ Bradley Mitchell. "bridge – network bridges". About.com. Archived from the original on 2008-03-28. ^ "End System Multicast". project web site. Carnegie Mellon University. Archived from the original on February 21, 2005. Retrieved May 25, 2013. ^ For an interesting write-up of the technologies involved, including the deep stacking of communication protocols used, see. Martin, Thomas. "Design Principles for DSL-Based Access Solutions" (PDF). Retrieved 18 June 2011. ^ Paetsch, Michael (1993). The evolution of mobile communications in the US and Europe: Regulation, technology, and markets. Boston, London: Artech House. ISBN 978-0-8900-6688-1. ^ Bush, S. F. (2010). Nanoscale Communication Networks. Artech House. ISBN 978-1-60807-003-9. ^ Margaret Rouse. "personal area network (PAN)". TechTarget. Retrieved January 29, 2011. ^ "New global standard for fully networked home". ITU-T Newslog. ITU. 2008-12-12. Archived from the original on 2009-02-21. Retrieved 2011-11-12. ^ "IEEE P802.3ba 40Gb/s and 100Gb/s Ethernet Task Force". IEEE 802.3 ETHERNET WORKING GROUP. Retrieved 2011-11-12. ^ "IEEE 802.20 Mission and Project Scope". IEEE 802.20 — Mobile Broadband Wireless Access (MBWA). Retrieved 2011-11-12. ^ Mansfield-Devine, Steve (December 2009). "Darknets". Computer Fraud & Security. 2009 (12): 4–6. doi:10.1016/S1361-3723(09)70150-2. ^ Wood, Jessica (2010). "The Darknet: A Digital Copyright Revolution" (PDF). Richmond Journal of Law and Technology. 16 (4). Retrieved 25 October 2011. ^ Peterson, L.L. ; Davie, B.S. (2011). Computer Networks: A Systems Approach (5th ed.). Elsevier. p. 372. ISBN 978-0-1238-5060-7. ^ ITU-D Study Group 2 (June 2006). Teletraffic Engineering Handbook (PDF). Archived from the original (PDF) on 2007-01-11. ^ Telecommunications Magazine Online, Americas January 2003, Issue Highlights, Online Exclusive: Broadband Access Maximum Performance, Retrieved on February 13, 2005. ^ "State Transition Diagrams". Archived from the original on October 15, 2003. Retrieved July 13, 2003. ^ "Definitions: Resilience". ResiliNets Research Initiative. Retrieved 2011-11-12. ^ Simmonds, A; Sandilands, P; van Ekert, L (2004). "An Ontology for Network Security Attack". Lecture Notes in Computer Science. Lecture Notes in Computer Science. 3285: 317–323. doi:10.1007/978-3-540-30176-9_41. ISBN 978-3-540-23659-7. ^ a b "Is the U.S. Turning Into a Surveillance Society?". American Civil Liberties Union. Retrieved March 13, 2009. ^ Jay Stanley; Barry Steinhardt (January 2003). "Bigger Monster, Weaker Chains: The Growth of an American Surveillance Society" (PDF). American Civil Liberties Union. Retrieved March 13, 2009. ^ Emil Protalinski (7 April 2012). "Anonymous hacks UK government sites over 'draconian surveillance'". ZDNet. Retrieved 12 March 2013. ^ James Ball (20 April 2012). "Hacktivists in the frontline battle for the internet". The Guardian. Retrieved 17 June 2012. Shelly, Gary, et al. "Discovering Computers" 2003 Edition. Kurose James F and Keith W. Ross : Computer Networking: A Top-Down Approach Featuring the Internet, Pearson Education 2005. William Stallings, Computer Networking with Internet Protocols and Technology, Pearson Education 2004. Dimitri Bertsekas, and Robert Gallager, "Data Networks," Prentice Hall, 1992.